Here are some frequently asked questions about Active Democracy. Feel free to suggest additional questions (via feedback). I need a reading list on various forms of community consultation, can you help? Yes, I do have a list of publications, as well as some online for download. You can find them under Publications. Many other people have written about these issues. Check the reference list at the end of each of my publications. This should provide a useful starting point. Let me know via Contact if there are any readings you would add to this list. Can you tell me how to run a citizens' jury? With some collaborators I have written several handbooks, e.g. on residents' feedback registers, citizens' juries and youth juries. There are also a number of very useful sites. An excellent starting point would be the Jefferson Center and Loka Institute. Small, modified juries are also possible. Here are a couple of tiny case studies to show you what's possible, read the Ballina case study and the Wollondilly case study. These ideas surely require considerable faith in ordinary people? Yes. Experience shows that such faith is well founded. Typical citizens are capable of dealing extremely well with complex issues. That's what has happened in the citizens' juries, consensus conferences and deliberative polls of which I have been a part. Don't take my word for it, examine the recommendations and decisions that have emerged from the many citizens' juries and consensus conferences that have been conducted throughout the world (go to links). This should dispel any suggestion that typical citizens might be incapable of dealing with complex issues, with attention being paid, not to self interest, but to the common good. Remember these participatory processes require a skilled facilitator who enables the group to find its way with the use of micro-processes such as brainstorming, nominal group technique, issues mapping and so on. leadership is fluid--functions are shared--individual abilities are seen in terms of group benefit. I'm a service provider, working for government, how do I decide when to use a deliberative design like a citizens' jury and when not to use one? How much is a citizens' jury likely to cost? How long is a piece of string? The Ballina jury cost AUD$400	because it was a local jury, organised and conducted by volunteers, and	participants were not recompensed either. The Wollondilly jury which was conducted by a consultant on behalf of a shire council	cost less than AUD$10,000. 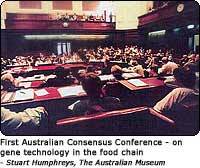 Australia's first consensus conference	cost AUD$175,000. Surely people are too apathetic to participate in this type of consultation? Is it apathy, I wonder, or have people's participatory muscles become atrophied	through lack of use. We learn to participate by participating. People	are often unwilling to participate because they lack the confidence needed	to do so. Organisers of deliberative designs in Australia have usually	appreciated this. Organisers must be prepared to make personal contact	with the people who have been randomly selected by phone or face-to-face. This is necessary to assure reluctant participants that	they are exactly the type of participant that organisers are seeking. Once persuaded, citizens	come along, participate fully and become more engaged citizens (and some interesting longitudinal studies are being undertaken	in the UK which support this claim). How do you randomly select participants for a deliberative poll or a citizens' jury or consensus conference? Not all of the deliberative designs that have been conducted have used random selection, though this is the ideal. Organisers have used a variety of selection methods; some have used stratified random selection and some have used self-selection. With small deliberative designs like citizens' juries the aim is find a pool that reflects a cross section of the population, to draw together a very diverse range of attitudes, values and opinions (usually randomly matching them to a profile). With a larger method like the	deliberative poll the aim is create a statistically significant, representative sample. Genuine random selection would involve conscription and this has never occurred with a deliberative design. A profile of the population is developed to suit the issue eg gender, age, class, ethnicity, housing tenure, occupation, education, geography, religion, attitude. Recruiters find participants to match profile using combination of door-to-door, approaching people in street etc, eg some UK citizens' juries. Advertisements are placed in local, state or national newspapers asking for participants. The issue is specified and respondents are asked to write a brief explanation about their interest. Respondents are then selected according to diversity, eg some consensus conferences. Advertisements are placed in newspapers. No detail is given except that it involves research and their views as a citizen are sought. Respondents are then phoned, a survey is completed, then respondents are matched to a profile, eg Australian consensus conference. Letters are sent to citizens who are randomly selected from electoral roll, inviting them to participate. Given minimal information about issue except date & duration. Respondents complete a questionnaire to provide demographic data. Responses are matched to profile criteria then randomly selected, eg more recent Danish consensus conferences. Prospective participants are randomly selected via electoral roll. Sent invitation to participate. Followed up with telephone call or personal visit. Suits small community, eg Boulder transport plan. Random digit dialling. Ask to speak to a person in the household over specified age, the one who has a birthday closest to today's date. Then invitation extended to participate, eg deliberative polls. Aren't we simply too busy to participate? This is one of the strengths of deliberative designs. They are one-off events. Committees can feel like a lifetime sentence. In contrast, a week-end of deliberation with total strangers seems to be stimulating, challenging,	educative and empowering. There is a surprisingly high take-up rate for these consultation methods, probably because they	are seen to be more meaningful than completing a superficial opinion poll	or perhaps they are less daunting than a committee without end. Read more articles on Active Democracy.